Solar and renewable energy are quite popular these days. Through a lot of government support, marketing and subsidies solar products are quite popular these days in India. Many people want to adopt these technologies but are unaware of what to do and how to get it. We at Bijli Bachao thought that helping people understand they can adopt renewable sources at their homes could be of great help. So we start with this article on Solar Water Heater systems, providing most of the details one can have questions on. Solar water heater is a system that utilizes solar energy (or the energy from sunlight) to heat water. It has a system that is installed on a terrace or open space where it can get sunlight and the energy from the sun is then used to heat water and store it in an insulated tank. The system is not connected to electricity supply and thus does not have an on-off switch, but it uses the sunlight throughout the day to heat the water and store it in the storage tank. Water from the storage tank can then be used for any application as desired. 1) FPC (Flat Plate Collectors) system: These are metallic type systems and have a longer life. 2) ETC (Evacuated Tube Collectors) system: These systems are made up of glass and are fragile. Both these type of water heaters come with or without pump. Pump is used to move water from collectors to the storage tank. Those without pump use thermosyphon principle to move water from collectors to storage tank automatically. ETC systems are fragile but are cheaper. They are also very good for colder regions where the temperature is sub zero. In place where the water is salty, these systems require regular cleaning due to deposition of salt on the inner surface of glass tubes. FPC systems are long lasting, as they are metallic. But they are expensive than ETC systems. They can work in colder regions with sub zero temperature but will need an anti freeze solution making the system expensive. In places with salty water a heat exchanger is required with FPC system to avoid scale deposition that can impact the heating capability of the system. System without pump (thermosyphon) is ideal for domestic and small application users (as it is cheaper) provided water does not have high chlorine content. Those with pumps are good for industries. Many people have concerns that solar systems will not work on overcast days. Well a system can still work if the overcast is not long (less than a day or two) as the system works on diffused radiation in the atmosphere. A solar system can also be integrated with an existing electric system that can act as a backup during the days when the overcast is long. The electric system can switch on if the water temperature from the solar water heater goes down below 40oC. Electric backup is not required in solar system if you have an existing electric water heater. In case you do not have an existing water heater, you can install an electric backup. You can also keep the two systems separate and use the electric system only when needed. If you have ETC system then glass can break, as it is fragile. So the glass may need occasional replacement. 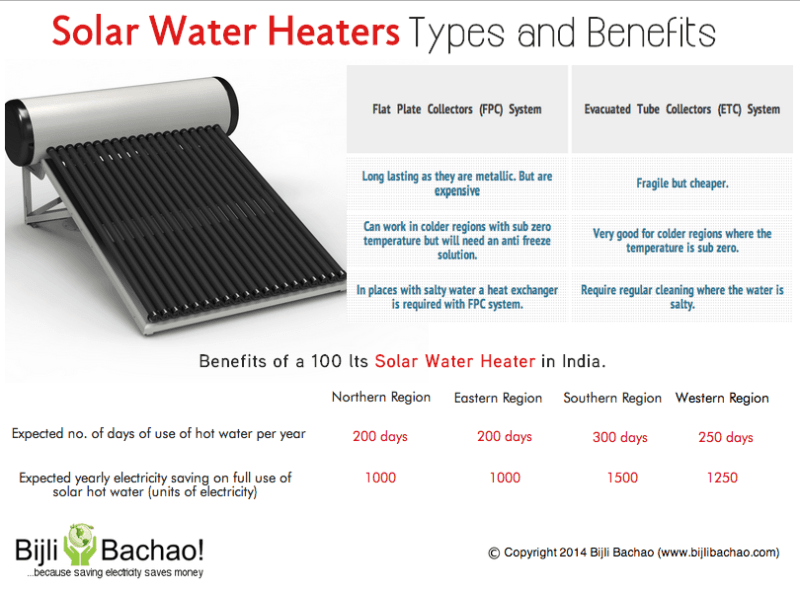 Scaling happens on solar water heaters regularly especially if the water is hard. So the collectors need regular cleaning using acid. If the outside surface of water heater is painted, then it may need a repaint every 2-3 years to prevent corrosion. Occasional leakages could happen in the system and local plumbers can repair those. The liter per day mentioned above is liters of hot water at (60-70oC). A 100 liters size is suitable for a family of 4. You can check more on sizing of water heaters in our article: Choose the right sized water heater/geyser for electricity saving. The units used for water heating depend on the amount of water that is heated, so the number of unit increases proportionately as the size increases. You can use our calculator to find out how much do you pay per unit of electricity to evaluate savings: Online Electricity Bill Calculator – For all states in India. The cost above includes cost of collectors, insulated hot water storage tank, system piping, electrical backup, installation, etc with five-year performance guarantee as per the minimum technical specification laid down by MNRE. Costs towards piping from system to utility point, heat exchangers (if any), may be extra. In N-E & Hilly states, Remote areas and Islands, the cost may be higher by 15 to 20%. The above cost may vary from manufacture to manufacturer depending upon the salient features of their products. Government provides subsidies to consumers who buy solar water heaters. The subsidies available are: 30% at cost to consumers in general category states and 60% at cost to consumers in hilly areas, north eastern states and islands limited to certain benchmarks: Rs 3000 per sq.m. for ETC and Rs 3300 per sq.m. for FPC systems. The best source to get a solar system installed is your state nodal agency. Contact number of various state nodal agencies are available in MNRE website and also at http://www.mnre.gov.in/information/solar-water-heatres/. You can also get the same installed through an accredited channel partner of MNRE: list. Using solar water heater is a win-win situation for consumers, utilities and the environment. Renewable energy is future and embracing the same makes a lot of economic and environmental sense.